"I wanna do Passport. I wanna do Passport." The harmonics and bass loops of "Looking Glass Reprise" drowned out Sam Farzin's cries, and he relented. Christmas lights and butcher paper cutouts shuddered with each strum. 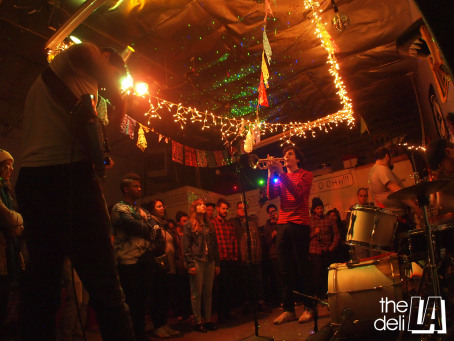 The nondescript DIY space VLHS —cousin to recording house/makeshift venue The Palisades— has been a musical hub for Pomona and the greater Inland Empire for four years running. On Sunday night, over 40 warm bodies packed themselves inside the walls, resting on the half-pipe, offering bud and new friendships as the tremors of Media Jeweler rattled their skulls. The atmosphere was loose, and it smelled like Red Forman's basement. Earlier, Jack Connor of opening band hit me, Harold joked about his goatee before burning a hole in our stomachs faster than you can say Rafa's Tacos. DOCKS frontman Ranier Tinkelenberg broke a string, but still slayed the crowd with Jack's honeyblonde Tele. Winter Break (ex- Summer Vacation) let out the most luscious screams as Mark Chen and Aaron Kovac gazed into each other's eyes. And to top it off, Hillary Chillton spoiled us at the end of the night with a new song (as of now un-named), going overtime with closer "Sad Dad/Rad Dad".